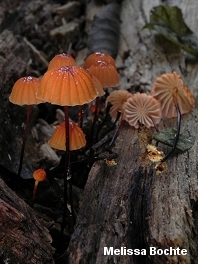 Arising from hardwood leaves and sticks, these tiny orange beach umbrellas are quite beautiful when fresh. 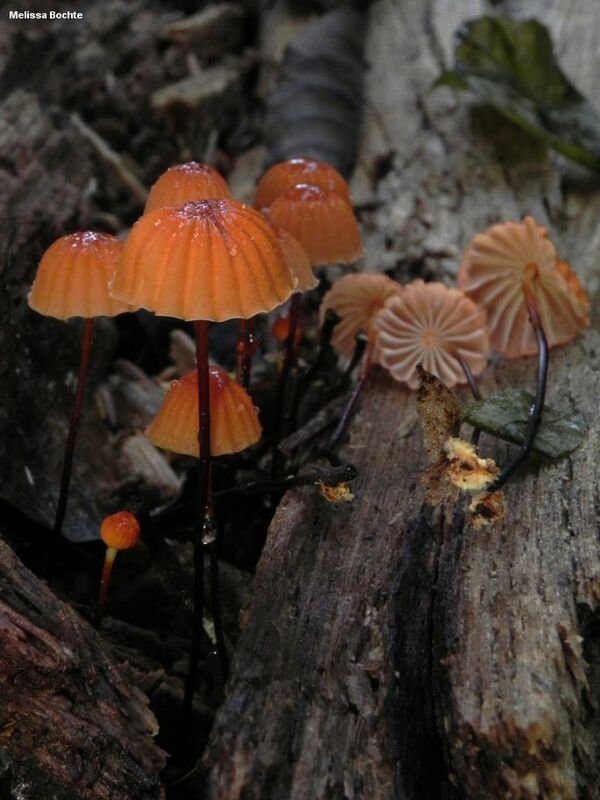 The orange, pleated cap, the wiry stem, and the very distant gills make this Marasmius easy to recognize. Other "pinwheel" Marasmius species include Marasmius rotula and Marasmius capillaris, with white caps; Marasmius pulcherripes, with a pink cap; and Marasmius fulvoferrugineus, with a rusty brown cap. 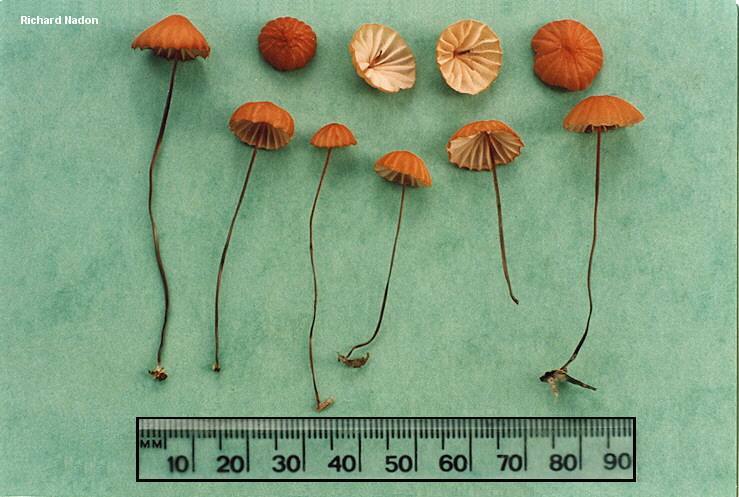 The orange color of Marasmius siccus fades in age or in dry weather; then it has less distinctive colors. Ecology: Saprobic on leaf litter and woody debris in hardwood forests (and sometimes on the needle duff of white pine); usually growing gregariously; summer and fall; widely distributed east of the Rocky Mountains. 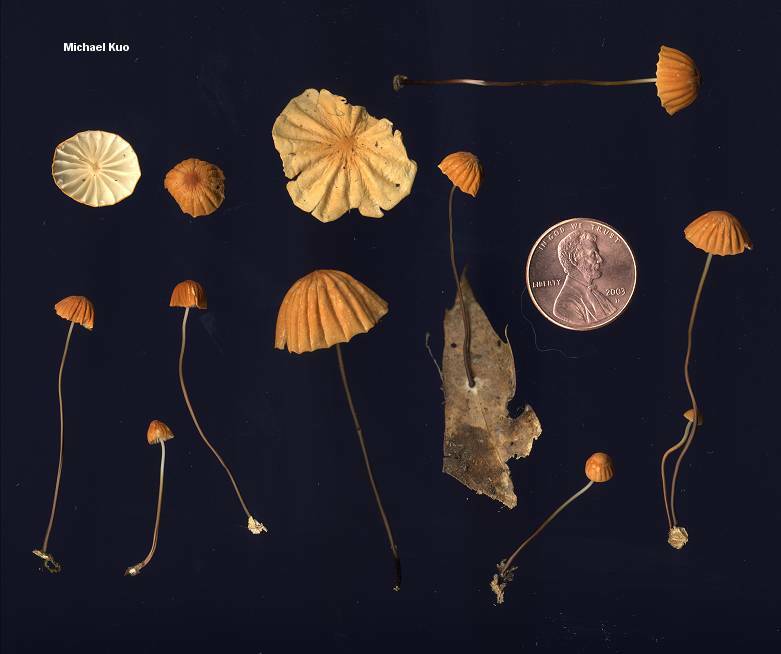 Cap: 5-30 mm; cushion-shaped or bell-shaped, with a knob or a central depression; conspicuously pleated; smooth or minutely roughened; dry; bald; orange when fresh, fading to pale orange. Gills: Attached to the stem or free from it; very distant; white to pale yellowish. Stem: 2.5-6.5 cm long; about 1 mm thick; equal; dry; wiry; whitish or yellowish above, brown toward the base; bald; basal mycelium white. Odor and Taste: Taste mild or slightly bitter; odor not distinctive. 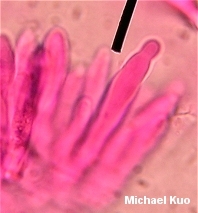 Microscopic Features: Spores 15-23.5 x 2.5-5 µ; smooth; spindle-shaped, cylindric, or club-shaped; inamyloid. Pleurocystidia cylindric, clavate, fusiform, or fusoid-ventricose; to about 70 x 15 µ; thin-walled. 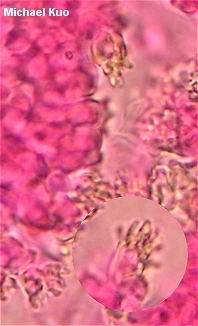 Cheilocystidia as dextrinoid broom cells. Pileipellis hymeniform, with dextrinoid broom cells. REFERENCES: (Schweinitz, 1822) Fries, 1838. (Saccardo, 1887; Kauffman, 1918; Gilliam, 1976; Smith, Smith & Weber, 1979; Arora, 1986; Phillips, 1991/2005; Lincoff, 1992; Horn, Kay & Abel, 1993; Barron, 1999; McNeil, 2006; Miller & Miller, 2006; Knudsen & Vesterholt, 2008.) Herb. Kuo 08040301, 09031201.